The most common cause of encephalitis is the herpes simplex virus. In fact, 70-90% of neonatal encephalitis cases are caused by the HSV-2 (or herpes) virus. When a mother has this virus and delivers her baby vaginally, the baby can contract the virus by coming into contact with the mother’s genital secretions. If the mother has active lesions, the baby should be delivered by C-section. Encephalitis in newborns can be severe, even fatal. It is for this reason that mothers with the herpes simplex virus are urged to get a C-section even if they aren’t experiencing an outbreak. Because a newborn baby’s immune system is not fully developed, the child is at a high risk of developing encephalitis if the virus is introduced and is more susceptible to the damages caused by the virus. The condition is especially dangerous for young babies because signs may not be clear to the caregiver. Often, encephalitis appears without warning. The only way to prevent it is by stopping the spread of the initial virus that causes it. Infants who experience encephalitis can suffer further complications if the issue is not addressed. It is the duty of medical professionals to recognize and treat conditions like encephalitis. Failure to due so or to prevent the spread of the virus that causes encephalitis may constitute negligence. If your infant has experienced encephalitis as the result of medical malpractice, call Thurswell Law. We have the knowledge and experience in birth injury lawsuits to get you the compensation you deserve. 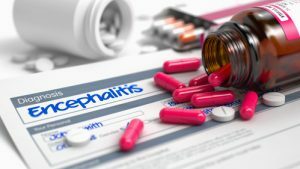 There is no way to truly rectify the damage done by encephalitis, but Thurswell Law will get you monetary compensation to help alleviate the suffering. For a free consultation, please call today at (248) 354-2222. No fee unless you collect.